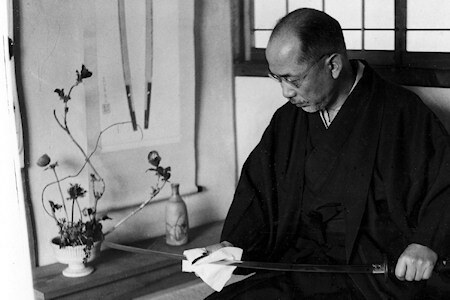 Founded in 1953 by Hitoshi Munemitsu (pictured right), Moriya Munemitsu YHC holds a special place among Japanese knife making companies. ‘YHC’ stands for ‘Yasuki Hagane Cutlery’. Yasuki Hagane is a brand-name of Yasugi Specialty Steels, aka YSS, a subsidiary of Hitachi Metals likely to be familiar to most readers as the foremost supplier of steels to the cutlery industry in Japan. Moriya Munemitsu YHC’s parent company Moriya Cutlery Laboratory is also a subsidiary of the Hitachi Metals group. When YSS gives a corporate gift showcasing their product it should be no surprise that they give knives. The knives they give are those produced by Moriya Munemitsu YHC. In addition to the knives that could grace your kitchen, Moriya Cutlery Laboratory produces the coin punches at the Japan Mint, medical implants, cutters for the space industry, racing boat propeller shafts, and components used in the manufacture of everything from automobiles to OLED's and semiconductors. This is a company at the forefront of precision steel manufacturing. Very high standards. Very good knives.